FREMANTLE says advice about correct terminology was behind the move to drop the term “clinical anxiety” in relation to Jesse Hogan’s mental health issue. In a media release on Monday, the Dockers’ general manager of football Peter Bell described Hogan’s condition as “clinical anxiety” on multiple occasions. He said the mental health problem could lead Hogan to make “poor decisions around alcohol consumption”, after revealing the 24-year-old was in an unfit state to train last Sunday. However, in a statement on Tuesday, chairman Dale Alcock urged commentators to consider Hogan’s wellbeing as he deals with his “anxiety disorder”. The West Australian reported criticism from medical professionals about the original term, with one saying “clinical anxiety was not a diagnostic category and using the term could confuse people about mental disorders”. The Dockers have removed all references to “clinical anxiety” in articles about Hogan on their website. Hogan has been sidelined from Sunday’s season opener against North Melbourne at Optus Stadium, and the marquee recruit does not have a timeline for his return to football. 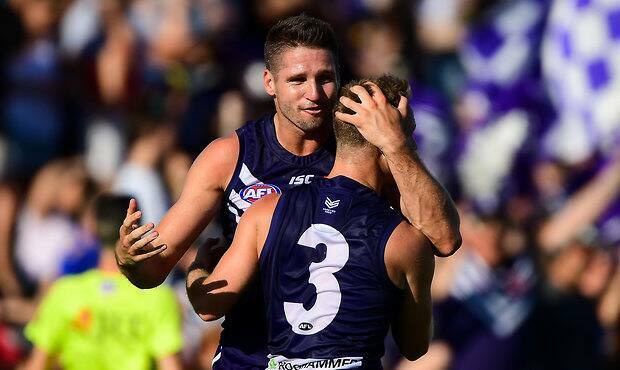 The Dockers insist he has not been suspended. Senior coach Ross Lyon urged media to “back off” on Wednesday during his weekly media conference, telling reporters “we need to respect this is a mental health issue. It’s a wellbeing issue”. He labelled cynicism surrounding players who reveal mental health issues as “dangerous” and said it could “potentially injure people”. Lyon sidestepped questions whether Hogan, who played both JLT Community Series matches, would have be named in round one if he had not consumed too much alcohol and been unable to train. “It’s a moot point. We’re dealing with what we’re dealing with and the facts are the facts,” he said.